Written by Catherine Saxelby on Wednesday, 15 July 2015. 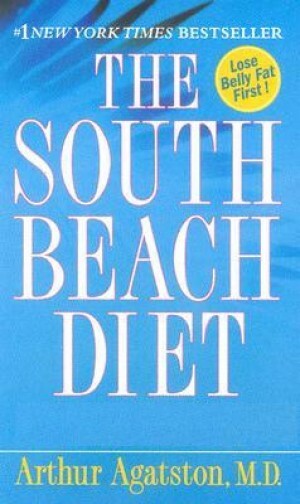 Named after the celebrity-studded South Beach in Florida USA, the South Beach Diet promised to be easy and enjoyable with no suffering or deprivation. But once you read through the 14 days of the initial weight-stripping (Phase 1), you soon realize that it's a very restricted diet, only one degree better than Atkins. Will you lose weight on it? Absolutely, but not for the regime or combination of foodstuffs - simply because you're only taking in a meagre 4500 kJ/1070 cals per day! On my first read of the book, I was impressed with how sympathetic and understanding the author (a cardiologist but one who needed to shed some weight himself) is and how balanced and nutritionally sound the diet would be. The text pays lip service to nutrition concepts such as the GI and to ‘healthy' fats like canola oil and nuts but sadly this is not reflected in the menus. There is no basic meal plan, just 14 days of menus for each phase plus recipes. The diet is divided into three phases, starting from zero carbohydrate and then reintroducing carbs back in small quantities. The advice is very oversimplified with little real diet information. no starchy foods at all, including no breads, cereals, rice, pasta, potato, corn and carrots. no milk or yoghurt is permitted, but you can happily enjoy cheeses, such as cheddar, feta, mozzarella and parmesan. However, skim milk is on the 14 menus and used in recipes. a small handful of nuts is allowed, limit yourself to only 30 pistachios or 20 small peanuts a day. only sugar-free sweets, chewing gum, jelly and sugar substitutes are allowed. These dietary changes apparently alter how your body reacts to food. The book claims that you'll lose 4 to 6 kilograms during Phase 1 and that your blood sugar and cholesterol levels will return to normal. You'll lose fat around your abdomen, and food cravings and appetite will decrease. It resembles Dr Atkins' initial induction phase, the only exception being that canola or olive oil can be eaten (but no other fats or margarine). Nothing apparently has to be measured, however you are encouraged to have meals of a ‘normal' size; enough to ‘satisfy your hunger but no more' (although the book quickly contradicts itself and does later specify the number of nuts allowed and how much juice). The Phase 2 Diet is the same as Phase 1, except you add in 1 to 2 serves of the ‘right carbs', like grainy bread or oats plus 1 piece of fruit. It's called a ‘more liberal' phase but I feel it's too low for long-term dieters. The dinner remains similar and includes just a protein with non starchy vegetables plus the same sugarless desserts. It's more balanced than Phase 1 and approaches a diet that I personally would be happy to recommend. Weight loss slows and you stay on Phase 2 until you reach your goal weight. If weight loss stops or if you break the diet (easy to do), you repeat Phase 1 to get back on track. Again, there is not much dietary information, just 14 days of menu plans. Once you have reached your ideal weight, you start on Phase 3, claimed to be the ‘most liberal' stage of the diet. You're meant to eat like this for the rest of your life - hardly achievable! And if you've overindulged, you're told to switch back to Phase 1 for a week or two. On Phase 3, you're supposed to eat 3 fruits and 3 serves of breads and cereals but this is not reflected in the menus. And the mid-morning and mid-afternoon snacks have disappeared for some strange reason. Even this final phase is fairly light and anti-carbohydrate. It still uses recipes from Phase 2 with sugar substitute to sweeten desserts and sugar-free jelly for a ‘treat'. Potato is allowed only on one day of the 14, no pasta at all and the odd couscous and rice accompaniment at dinner. A typical dinner (Day 3) is grilled sirloin steak, creamed spinach, ‘mashed potatoes' (really pureed cauliflower) and mozzarella-tomato salad. Hardly lashing out! The South Beach Diet is a spartan diet based on protein with non-starchy vegetables and salad that most dieters will find themselves hungry on. A marginal improvement on Atkins, it promises to be easy and effortless - but it's not! The initial Phase 1 is not balanced and may cause side-effects such as constipation and weakness. All fruit and starchy food is banned, no milk or yoghurt are allowed. It's not one I can recommend. There is no basic meal plan outline - just 14 menus - you end up relying on those instead of learning how to vary your meals yourself. How to make it more balanced and sustainable: add 2 slices of solid chewy grain bread, a tub of yoghurt and two pieces of fruit. Sugar is a ‘villain' and banned which is unnecessary. You're after a no-brainer - just follow the 14 days of menus for Phase 1, 2 (More Liberal) and 3 (Maintenance) plus accompanying recipes. Dr Arthur Agatston is a cardiologist at the Mount Sinai Medical Centre in Florida in the USA. His specialty was cardiac imaging (producing ‘pictures' of the heart and blood vessels) but he started advising his cardiac patients on how to reverse their blocked arteries and combat obesity. Having tried the low fat, high carb diet recommended by the American Heart Association in the 1990's, he became disillusioned with the lack of success and so (with the help of the dieticians at the centre) created his own high protein diet but with monounsaturated and polyunsaturated fats like olive oil, canola oil, peanut oil and nuts. Dr Agatston lost weight himself on the regime and like so many others, thought that he would try it on others. He says he conducted a trial of his diet against the strict Step 2 version of the AHA diet on 40 overweight volunteers. Over 12 weeks, the South Beach Dieters dropped 13.6 pounds, double that of the 7.5 pounds by the AHA group. He had fewer drop-outs and a lowering of triglycerides and a better ratio of HDL to LDL cholesterol. No reference is given for this study so one can only presume it has never been published. It was presented at a meeting of the American College of Cardiology but that's all. The South Beach Diet book has been updated and expanded and is now called The South Beach Diet Supercharged: Faster Weight Loss and Better Health for Life and now includes an exercise regime.